Standard Twin/Twin Bunk Bed Frame - Stained: Autumn Pine. Knotty Pine (ESLP) Engelmann Spruce Lodge Pole. Manufactured for Children in Standard Lenght and Adults in Extra Long. 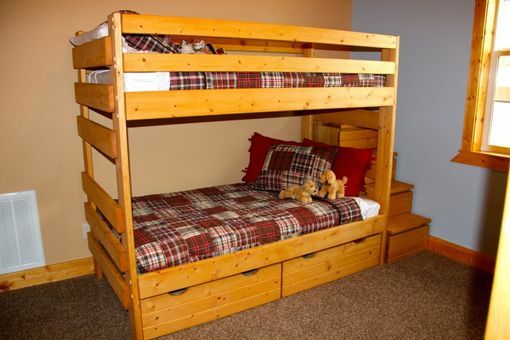 One Piece Head Boards with horizontal Safety Rails and Bed Rails that Lag Bolt toghether to assemble the Bed Frame. Solid Super Plywood Mattress Foundation. 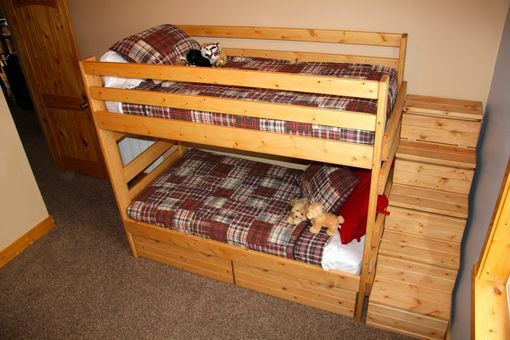 Optional Under Bed Rolling Storage Drawers and Corner Stair Storage Units Available. Mattresses Sold Separetly.